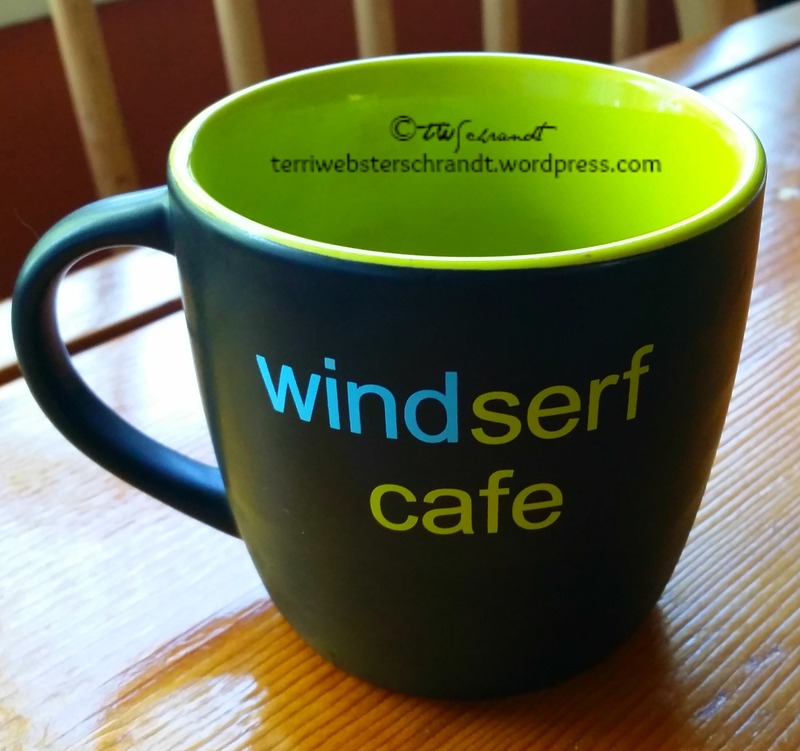 If we were having coffee, I would tell you what a whirlwind two weeks I had. By the way, how would you like your coffee this morning? I’m taking mine hot, with my favorite Bailey’s (non-alcoholic) creamer. We celebrated Mother’s day weekend flanked by two weekends of windsurfing. I sailed three days in a row the first weekend in May and it was indeed a whirlwind. Friday night was a great session but not as windy this past weekend. In between, we traveled to Spokane, Washington, where my 83-year old mom-in-law now lives in an assisted care facility. We were very pleased to see that she is happy, peaceful, and making new friends. Many of my hubby’s family members live near Spokane, and Coeur D’Alene, Idaho. Very beautiful country there! I plan to post Part Three next week about the wise use of social media and using link-ups to promote your blog. If you are interested, please stay tuned! If we were having coffee, since I yacked so much, I would have to go get a re-fill. Can I get you another cup? Being that May is National Water Safety Month, I posted “5 Tips for Water Safety.” As a leisure educator, swim instructor, and self-proclaimed water fowl, I want to draw attention to the importance of being safe in and around the water. Before I retired from my job, May was always a crazy, busy month getting 150 lifeguards hired and trained. I guess the water and safety education is still in my blood! And May is still a crazy, busy month…what’s up with that? Memorial Day weekend, the fourth Saturday in May, marks my daughter’s graduation from college. She will receive her Bachelor of Science degree in Recreation Therapy. Her graduation is at 8:30am then we have a large group of family and friends coming over to my house for a lunch BBQ and celebration. So I am planning for that now, but I will save that for another post! Traveling involves unpacking, packing, etc. and living out of a suitcase. As much as I love to travel, it is always nice to be home. How was your week? I wish you a great second half of May. Take a minute and check out my gallery of some photos from Spokane and Idaho. View from my brother-in-law’s lawn chair…I wish this was my backyard. Thank you! So far,so good! 501 now :). And here I was just mentioning the Pacific Northwest in my coffee post. Thanks for sharing at #AnythingGoes and for sharing your blogging tips. No matter how long someone has been blogging, they can learn something to help them. Sounds like you’ve had a really bus few weeks! Congrats on the blogging successes, and what lovely photos those are! 🙂 You’re quite welcome—thanks for joining in! I’d love to try windsurfing, I love watching the windsurfers near to where I live. Thank you for sharing the pictures of your trip Washington looks amazing. I visited near Seattle many years ago and thought it was amazing and beautiful. Would love to visit there again one day. Looking forward to reading more of your blog this week. 🙂 Thanks for the cuppa. Thank yo very much! I just learned this windsurfing craziness at age 49–talk about a high learning curve! And thank you for the follow!! Oh such lovely photos – I feel serene just looking at them. Sounds like you’ve had a lovely and busy May with more wonderfulness coming up. Enjoy! I’m so glad I stopped by for coffee today. Sounds like a busy couple of weeks. Beautiful photos as always. Thanks for coffee and a lovely post. And these photos, my dear! How beautiful. I am going to confess my jealousy too. Windsurfing for 3 days? We are about to declare spring has never arrived here as the temps are not helpful. It feels still like winter. Too cold for windsurfing. I am glad I can enjoy your adventures through your nice stories. Congratulations for your daughter’s graduation! Thanks for a lovely coffee, and have a great week. Thank you, Lucile! Despite our drought, we are having a nice spring. Sorry to hear it’s still wintery in Amsterdam, hopefully summer weather is just around the corner. Enjoy your week! You’re welcome, Terri. The drought there may go away soon. I read yesterday about a new El Niño on its way, similar to the one of 98, and that means rain for California. Hubby and I have been on the road for three weeks so I understand your feelings about living out of a suitcase. Good to be home but we had a great time. Congratulations on your daughter’s graduation! Sounds like she is following in Mom’s footsteps. Good to “see” you, Janis! Hope to see some photos of your trip! I have a ton of photos – just going through them now. I will absolutely share! Glad you could stop by on your busy trip! I’ve been reading about your trip and hope you are having the time of your life! We’ve got some down time in the car so i thought I’d read a bit. Yours was at the top of the list. I enjoy reading the “If we were having” posts.